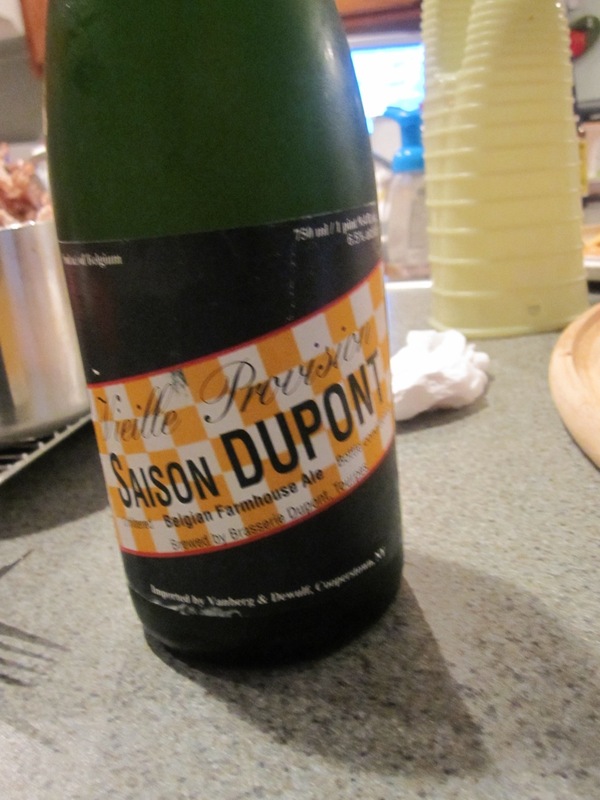 Round 3 of our mini Thanksgiving Day beer tasting was the Saison Dupont Farmhouse Ale. Since I’ve already written about this outstanding beer, this will be more about how it went with our meal. Once dinner was ready, we sat down and immediately started passing around the food. We had a traditional Thanksgiving meal, i.e. oven roasted turkey, candied yams, corn, mashed potatoes, biscuits, gravy, and brussel sprouts with carmelized shallots. The Saison Dupont was the perfect beer for this meal. It’s crisp, dry flavor paired well with our very rich and flavorful meal, but was never overpowering. The beer didn’t last very long, and it seemed to be very well received by my In-Laws. I’ve had many excellent Farmhouse Ales this year, but the Saison Dupont is still my favorite. I will yet again give it a solid A. This does seem to be a popular beer, got my father drinking it when we were in Bruges – it really is the quintessential saison. Ah Bruges! I never had the chance to go. The last time I had the opportunity (1990), there was a train strike in Belgium, so we had to go from Amsterdam to Paris with no stops. Looks like a great place to spend a couple days. Belgium is on my short list of places to visit. Would make a great 7 to 10 day trip. Lots of beer, food, and perhaps a visit to Spa-Francorchamp to see a race. FUN!